While we've been very happy with our FP Big28 Turbo, every product can always be improved, so it's always worth taking a closer look at how it is performing every once and a while. The blue line is Throttle Percentage. The orange line is Boost Pressure. The green line is Engine RPM. and the purple lines are the cursors. 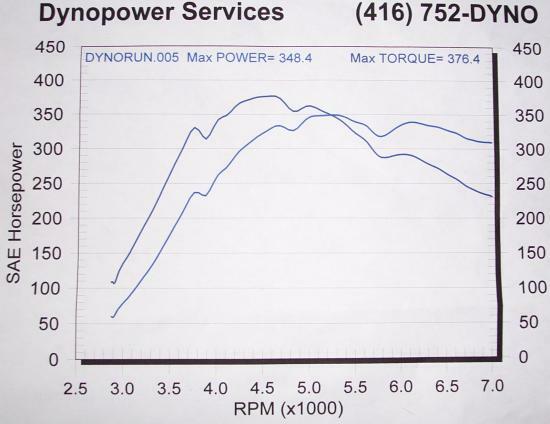 The engine gained 700 RPM in the time it took to spool the turbo. Now 18 PSI of boost is not bad, but we'd really rather hold a solid 22 PSI all the way through the pull. A loss of 4 PSI represents a pretty stiff loss of power. At first, we though this boost drop was due to a leaky BOV, but we fixed that earlier this year - this plot is from after the fix. Eliminating the leak helped the situation, but didn't eliminate the problem. Forced Performance to the rescue! The standard wastegate actuator in the FP Big28 (and for that matter, in the stock T25) has an 11lb spring. The small turbine housing used on the Big28 and the T25 helps ensure fast spool response, but it also acts as a flow restriction at high RPM. Accordingly, the exhaust pressure in the housing starts to build up, and eventually, it can overcome the wastegate spring and force open the wastegate. Forced Performance now offers an upgraded wastegate actuator that has a 17lb spring. With this actuator, it should be possible to hold 24 psi all the way through the rev range on a Big28 or a T25. Here it is! Looks pretty stock, save the adjusting nut on the actuator rod. This gives it some range of adjustability, but FP has preset this one to 17lbs. Off to the dyno to test! Here's the car, strapped onto the Dyno Power Services dynojet, ready to go. Notice the salt on the car - I really need an enclosed trailer. The dyno crew. Driving, tuning advice, and FWD conversion provided by Magnus Motorsports. That's the Grand Fishstick himself, Marco, mugging for the camera. Notice the dyno control screen in the background, and the laptop connected to the EFI computer on the passenger seat. The Magnus and Dyno Power crews put in a long hard day, converting the car to FWD, making 20 passes on the dyno, and then converting it back to AWD for the drive back to Windsor. Thanks guys! The best pull of the day. We've got an intermittant misfire (which turned out to be an excessive spark plug gap) that kept the curves from being real pretty, but you can see the general shape of the graphs. 348 HP and 376 ft/lbs of torque is not bad at all. That's the FP Big28 for you! Unfortunately, the upgraded wastegate spring didn't fix the problem. The boost curves before and after were pretty much the same. It seems that our loss of boost pressure comes from some other cause than the wategate opening prematurely.